I greatly enjoyed Seraphina. Dragons, half-dragons, and an entirely new world to settle into and become familiar with–who could ask for more? So I was thrilled when the sequel came out, so excited to be part of that world again and to see how Seraphina grew and became herself by the end. 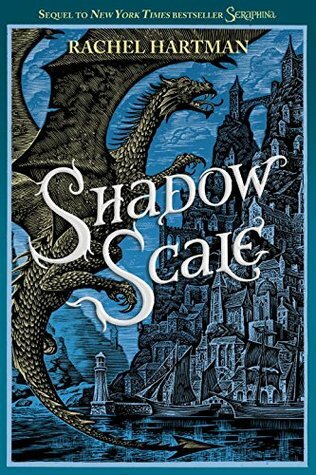 Some of the reviews for Shadow Scale indicated that the narrative would be disappointing, and so I was a little nervous going into the reading that I might come out of it feeling that something was missing. What I experienced, though, was exactly the opposite. I loved this book, the dragon-lore, the scope and breadth of the plot (from gathering the ityasaari to the war between neighboring kingdoms), and most especially the high and low places that Seraphina’s character walks through to come into herself fully and freely. What I wanted, to see Seraphina become strong and independent, worthy of love and of loving, was exactly what Rachel Hartman delivered. Her last line “I walked myself into the world” perfectly encapsulates the journey that Seraphina traveled from those first pages until the end. For me, the story was always about that. Thank you again, Ms. Hartman, for sharing Seraphina with us.